Living Colour is an American rock band from New York City, formed in 1984. Stylistically, the band's music is a creative fusion influenced by heavy metal, funk, jazz, hip hop, punk, and alternative rock. Their lyrics range from the personal to the political, in some of the latter cases attacking Eurocentrism and racism in America. Living Colour rose to fame with their debut album Vivid in 1988. Although the band scored a number of hits, they are best remembered for their signature anthem "Cult of Personality", which won a Grammy Award for Best Hard Rock Performance in 1990. They were also named Best New Artist at the 1989 MTV Video Music Awards and won their second Grammy Award for their follow-up album Time's Up. After disbanding in 1995, Living Colour reunited in late 2000. English-born guitarist Vernon Reid had formed a number of bands, and after a few years, he formed Living Colour in New York in 1984. 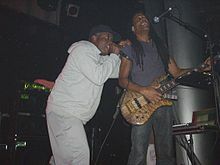 Reid assembled a number of bands under the name Vernon Reid's Living Colour from 1984 to 1986. Reid was well known on the downtown New York jazz scenes because of his tenure in Ronald Shannon Jackson's Decoding Society. In 1986 a stable lineup was formed, consisting of vocalist/actor Corey Glover, guitarist Vernon Reid, bassist Muzz Skillings, and drummer Will Calhoun (who had graduated with honors from Berklee College of Music), and the band hired managers Jim Grant and Roger Cramer. Soon after, the band became experienced at touring, including performing regular gigs at the club CBGB. Vivid, released on May 3, 1988, gathered sales momentum only when later that year, MTV began playing the video for "Cult of Personality". The album reached No. 6 on the U.S. Billboard 200 chart. On April 1, 1989, the band performed on NBC's Saturday Night Live. Four months later, the band gained further exposure as an opening act, along with Guns N' Roses, for The Rolling Stones' Steel Wheels/Urban Jungle Tour. In 1990 the band's second full-length album, Time's Up, featured songs in numerous musical contexts; jazz fusion, punk rock, Delta blues, hip hop (cameos by Queen Latifah and Doug E. Fresh), funk, thrash metal, jive, and hints of electronica were all represented. The album reached No. 13 on the Billboard 200, and won a Grammy Award for Best Hard Rock Performance. Other guests included Maceo Parker and Little Richard. In 1991, Living Colour joined the inaugural Lollapalooza tour, and released an EP of outtakes entitled Biscuits. In 1992, Skillings left the band and was replaced by Doug Wimbish. This new line up released their third full-length album, Stain, in March 1993. The album reached No. 26 in the U.S., a further drop since their debut. Despite retaining their strong fan base, Living Colour disbanded in January 1995, after failing to settle on a common musical goal during sessions for their fourth studio album. Four of these tracks were included on the compilation Pride. Following the breakup, individual band members released a variety of solo efforts. Living Colour re-formed on December 21, 2000, at CBGB as a gig billed "Head>>Fake w/ special guests". Head>>Fake was the current drum and bass project headed by Calhoun and Wimbish. Glover was on the bill to sing a few songs and Reid came on after three songs. The reunion was followed by the release of the band's fourth studio album, Collideøscope, in 2003, their first album not to chart in the United States, although it was critically praised. In 2005, Sony Records released Live from CBGB's, a live album recorded on December 19, 1989, as well as another best-of compilation, Everything Is Possible: The Very Best of Living Colour, with songs from Vivid to Collideøscope. In August 2006, Glover took on the role of Judas Iscariot in a national tour of Jesus Christ Superstar, touring with JCS veteran Ted Neeley. Doug Pinnick, vocalist and bassist of King's X, filled in for Glover on lead vocals. Glover's tour of the musical ran through June 2008, and he then rejoined the band. On September 22, 2006, Skillings joined the band for the first time in fourteen years when they played at a private party which drummer Jack DeJohnette threw for his wife Lydia. Wimbish was unable to come back from his base in London to play for the event, so Skillings agreed to take over for the special private event. On October 25, 2008, MVD Audio and CBGB Records released CBGB OMFUG MASTERS: August 19, 2005 The Bowery Collection, a soundboard collection of songs from the Save CBGB's benefit show. On November 25, 2008, Inakustik and MVD released The Paris Concert, a DVD recorded at New Morning, in Paris, France, during their 2007 European Tour. The band released their fifth studio album, The Chair in the Doorway, on September 15, 2009 on Megaforce Records. The album sold approximately 2,800 copies in its first week and landed at No. 159 on the Billboard 200. This was the band's first album to chart since Stain in 1993. The band toured the world in support of the record. In an interview on breakdownroom.net, Glover hoped to release another album with the band next year. "We're going to do something different [for us] and make a real record, right now, right after we've done this one," Glover said with a laugh. The band's song "Cult of Personality" received fresh exposure from 2011, as it was used as the entrance music for professional wrestler CM Punk. In 2013, Living Colour performed the song live during Punk's entrance at WrestleMania 29. On July 2, 2014 Living Colour announced on their official website that they were putting the finishing touches on their upcoming sixth album Shade, which was released on September 8, 2017. "Shade is the sound of a band coming to terms with its shadows and light, From the blue pulpit of Robert Johnson to the mean red streets of Brooklyn to the golden lure of Hollywood, Shade is the next chapter of a unique American journey," Reid stated on the official website. The album includes 10 originals and 3 covers: Robert Johnson's "'Preachin' Blues", Notorious B.I.G. 's "Who Shot Ya?" and Marvin Gaye's "Inner City Blues'" available on CD, MP3, and vinyl. On August 19, 2016 the band released a cover of The Notorious B.I.G. 's "Who Shot Ya? ", from an upcoming EP entitled Mixtape which was released on September 9. It features appearances from Chuck D, Black Thought, Pharoahe Monch, Prodigal Sunn, and Kyle Mansa. Living Colour was ranked No. 70 on VH1's 100 Greatest Artists of Hard Rock. "Cult of Personality" was part of the Grand Theft Auto: San Andreas repertoire of radio songs in Radio X. It was also the first song to be confirmed for the track list of Guitar Hero III: Legends of Rock. The version featured in Guitar Hero III is a new master recording of the song that features an updated solo, as the original masters could not be used. In October 2006, "Love Rears Its Ugly Head" was ranked and voted 303 out of the 2006 songs featured in the Triple M Essential 2006 Countdown. Rolling Stone have called the band "funk metal pioneers." In early 2009, WWE used "Cult of Personality" in the video promoting the induction of Stone Cold Steve Austin into its Hall of Fame. WWE performer CM Punk used the song as his entrance theme in Ring of Honor for a period of time. CM Punk used other licensed music while working with WWE, but, after feigning a departure from the company in July 2011, he returned with "Cult of Personality" as his entrance theme. CM Punk also entered to the song at his debut in the world of mixed martial arts at UFC 203 and subsequently at UFC 225 for his fight versus Mike Jackson. Mahon, Maureen (June 23, 2004). Right to Rock: The Black Rock Coalition and the Cultural Politics of Race. Duke University Press. p. 5. ISBN 9780822333173. Caramanica, Jon (February 2002). "Electric Warriors". Vibe. p. 88. Vladimir Bogdanov; Chris Woodstra; Stephen Thomas Erlewine, eds. (2002). All Music Guide to Rock. Hal Leonard Corporation. p. 663. ISBN 9780879306533. Larkin, Colin (May 27, 2011). The Encyclopedia of Popular Music. Omnibus Press. p. 926. ISBN 9780857125958. Chuck Klosterman (1 November 2007). Fargo Rock City: A Heavy Metal Odyssey in Rural North Dakota. Simon and Schuster. p. 165. ISBN 978-1-4165-8952-5. Chuck Klosterman (14 September 2010). Chuck Klosterman on Rock: A Collection of Previously Published Essays. Simon and Schuster. p. 33. ISBN 978-1-4516-2449-6. Martha Bayles (15 May 1996). Hole in Our Soul: The Loss of Beauty and Meaning in American Popular Music. University of Chicago Press. p. 338. ISBN 978-0-226-03959-6. "Living Colour: Keeping The Music Alive". All Things Considered. NPR. December 6, 2009. Archived from the original on April 29, 2016. Retrieved April 29, 2017. McIver, Joel (17 November 2011). Overkill: The Story of Motorhead. Music Sales Limited. p. 162. ISBN 978-0-85712-718-1. Mark Katz (3 April 2012). Groove Music: The Art and Culture of the Hip-Hop DJ. Oxford University Press. p. 180. ISBN 978-0-19-991301-5. ^ "Alternative Metal". Allmusic. Rovi Corporation. Archived from the original on 23 December 2015. Retrieved 29 September 2015. ^ Heller, Jason (July 9, 2013). "One of Living Colour's hits illustrates an era in transition". AV Club. Archived from the original on October 30, 2016. Retrieved April 29, 2017. ^ a b c d e f g h i j Strong, Martin C. (2000). The Great Rock Discography (5th ed.). Edinburgh: Mojo Books. pp. 580–581. ISBN 1-84195-017-3. ^ Dustin Schoof (March 29, 2013). "Living Colour singer Corey Glover looks back on 25 years of 'Vivid'". LehighValleyLive.com. Archived from the original on March 4, 2016. ^ David Fricke (November 1, 1990). "Living Colour's Time Is Now". Rolling Stone. Archived from the original on September 12, 2017. ^ Greg Prato. "Living Colour Time's Up". AllMusic. Archived from the original on August 6, 2015. Retrieved August 21, 2015. ^ Davey Boy (March 4, 2009). "Review: Living Colour Collideoscope". Sputnikmusic. ^ Dave Mount (March 6, 2008). "Living Colour Collideoscope". Prefixmag. Archived from the original on September 24, 2015. ^ "Note from Vernon Reid". www.livingcolourmusic.com. Archived from the original on 4 July 2013. Retrieved 5 May 2018. ^ Living Colour Back With Fifth Studio Album Archived 2013-04-23 at the Wayback Machine Billboard.com. Retrieved on 2009-07-08. ^ "LIVING COLOUR To Release 'Shade' Album In September; Cover Artwork Unveiled". Blabbermouth.net. May 12, 2017. Archived from the original on May 15, 2017. Retrieved May 14, 2017. ^ "LIVING COLOUR To Release 'Mixtape' Featuring Reinvention Of NOTORIOUS B.I.G. 's 'Who Shot Ya'". Blabbermouth.net. August 19, 2016. Archived from the original on August 22, 2016. Retrieved August 22, 2016. ^ "Living Colour Enlist Chuck D, Black Thought, More for Notorious B.I.G. "Who Shot Ya" Remake: Listen - Pitchfork". pitchfork.com. Archived from the original on 22 November 2017. Retrieved 5 May 2018. ^ "VH1 100 Greatest Artists of Hard Rock - YouTube". YouTube. Archived from the original on 21 May 2017. Retrieved 5 May 2018. ^ "What Happened After SmackDown, Punk's Theme Song, Updates on Finlay & Cara - WRESTLESCOOP". wrestlescoop.com. 28 July 2016. Archived from the original on 4 March 2016. Retrieved 5 May 2018.